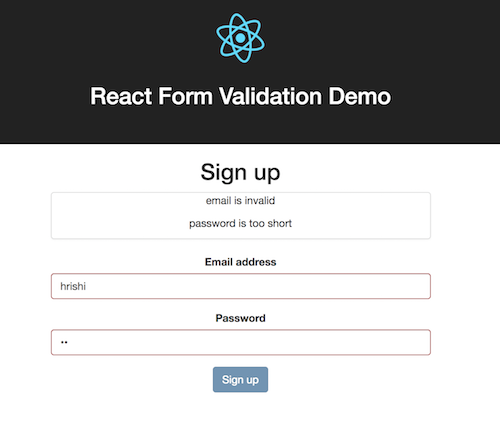 This is a step-by-step tutorial that will show you how to do basic form validation in React. You can see the full code on Github and see the app running on Heroku. We’ll use create-react-app to get up and running quickly with a simple React app. That opens http://localhost:3000/ where our new app is running. Ok, now let’s build the core of our demo app. Let’s add a Form component. Now, let’s create that Form component in src/Form.js. 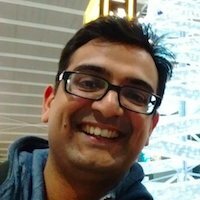 Want to learn how to do form validation with React in a Rails app? We’ll make a simple sign up form with email and password input fields and a submit button. I’ve copied an example form from the Bootstrap docs so that it looks nice out of the box. But notice I had to change some things to make it work with JSX. We also need to make sure we close all tags including the input tag. We’re setting email and password to empty strings. But we’re not updating the state on user input, so if we type in the form fields now, our text won’t appear. Ok, now let’s get to the validation. We’ll save any validation errors and the validity status of the form in the state. We’re adding a property called formErrors which will be an object with the input field names as keys and any validation errors as their values. The initial value for each key is an empty string. We also have 3 boolean properties - emailValid, passwordValid and formValid, which we’ll use to enable or disable the form submit button, based on our validation results. We set their initial values to false. Now let’s add a new component called FormErrors for displaying any errors from our validation above the form. It’s a stateless functional component (or presentational component) which simply iterates through all the form validation errors and displays them. Now, we’ll call a validation after the user types in the field. The setState method takes a callback function as a second argument, so let’s pass a validation function to it. We do two different checks for the input fields. For the email field, we check it against a regular expression to see if it’s an email. Note: I’m using an example regex from the Devise library. Checking for emails with a regex is very complex, but this simple regex will do for our toy app. For the password field, we check if the length is a minimum of 6 characters or not. When the field doesn’t pass the check, we set an error message for it and set its validity to false. Then we call setState to update the formErrors and the field validity and we pass the validateForm callback to set the value of formValid. Let's set the disabled attribute of the submit button based on the value of the formValid state property. So with that, our basic form validation works. We can add one little enhancement by highlighting the input fields when they have an error. Now when a field has an error, it has a red border around it. This is a very simple example. We have hard-coded field names in our validation code, which is not ideal or scalable. We can also only have one validation per field, which is also not practical. 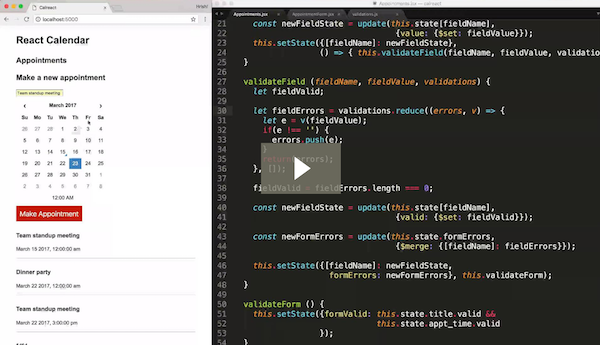 If you want to learn how to generalise our validation to handle more than 2 fields and multiple errors, have a look at The Complete React on Rails Course.